It’s almost that time of year again. When America gives thanks to the pilgrims and Native Americans by gorging ourselves on turkey and stuffing. But how many times have you thought of sushi on Thanksgiving day? Yep, if you’re like me, probably never. A hip and trendy downtown L.A. Japanese restaurant wants to change that. 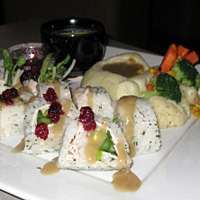 Takami has created what they are calling a turkey sushi roll to bridge the gap between east and west for Thanksgiving. I know what you’re thinking. No, it’s not raw turkey. The turkey roll consists of sliced turkey, avocado, asparagus, cucumber and sprouts wrapped in soy paper instead of nori. Instead of the normal vinegar flavored rice, it’s seasoned with dill and chives to compliment the turkey. The roll is then topped with a brown gravy. Takami made sure not to forget another Thanksgiving staple. The roll comes with cranberry jam on the side. When you look at this, it actually sounds quite good. It’s essentially Thanksgiving dinner… rolled. All that’s missing is the stuffing.